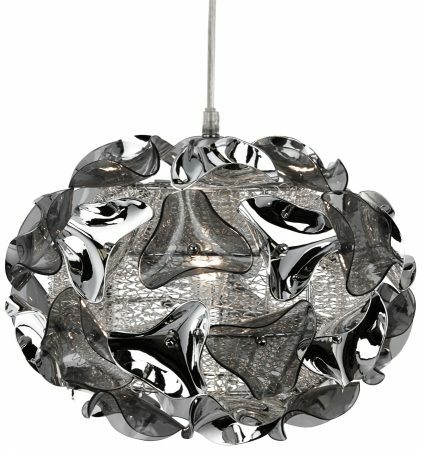 This Triangle modern 30cm chrome 1 light pendant with smoked acrylic curved details looks smokey and decadent. The central light is cloaked by smoked curved acrylic detail and a chrome wire mesh shade, which gives it a unique style. It also creates a nice lighting effect and sets the mood for the entire room. A 30cm chrome and acrylic 1 light pendant, featuring a central chrome sphere cage encased with aluminium spiral mesh and punctuated with chrome and acrylic petal detail, all suspended by a clear flex power cord. Height adjustable at time of installation to a maximum drop of 148cm. This unusual light fitting would make a great focal point in any stylish living or dining room. Part of the Triangle modern indoor lighting range.